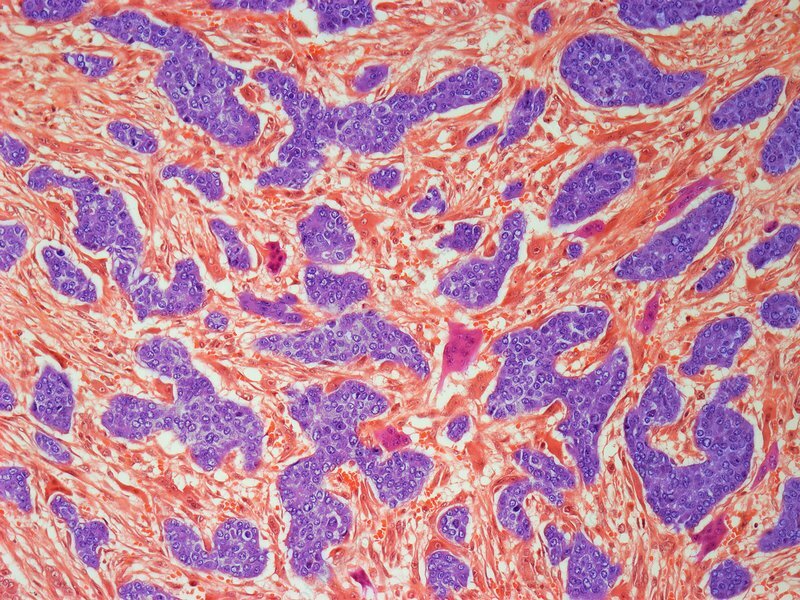 Breast cancer, light micrograph of a section of an invasive ductal carcinoma. Invasive ductal carcinoma, sometimes called infiltrating ductal carcinoma, is the most common type of breast cancer. About 80% of all breast cancers are invasive ductal carcinomas. A ductal carcinoma of the breast is a cancer that started in the cells that line the ducts of the breasts and has begun to spread into the surrounding breast tissue. Surgery tends to be the first treatment for invasive ductal breast cancer Histologically the cancerous cells (purple) invade and replace the surrounding normal tissues. Magnification: x 150 when printed at 10 centimetres across. Human tissue.